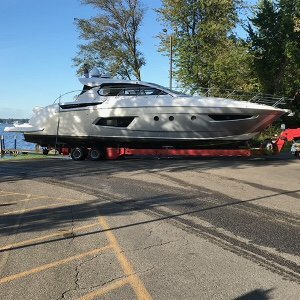 Advantage Marine provides heated storage for boat owners in West Michigan and we have winterization / storage packages for almost any size vessel you may own. Michigan winters can be harsh and can affect the lifespan of your investment. Inside heated boat storage will signficantly reduce the effects of UV exposure on all surfaces of your boat. This includes upholstery, stitching, carpets, and your original hull color. In our indoor facilty, your boat will maintain a more constant temperature which will keep your boat beautiful for years to come. Call (616) 748-9235 to speak with us now! 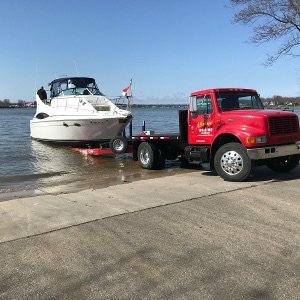 Haul-Out Services for Larger Boats! We also provide indoor cold storage as well. Pricing will vary by the size of boat. For boats with a beam size of 8′ 6″ of less, see our standard pricing for this season. Should I Reserve Storage Space Early? Our indoor heated & cold storage fill up fast as the season comes to an end. We do give preferential treatment to our existing clients but will always make room for new clients. It’s never too early to reserve your winterization / boat storage package. Call us at (616) 748-9235. Where is your boat storage located? The majority of our storage space is located within 5 minutes of Big Red Lighthouse on the north side of Lake Macatawa in Holland. What types of boats do you store? Large boats without trailers, boats with trailers, personal watercraft, fishing boats, pontoons, and just about anything which floats.